After initially being denied, local police chief allowed 'Women of the Wall' into the Western Wall plaza this morning with shofars. Dozens of women from the “Women of the Wall” organization, which aims to challenge the religious status quo in Israel and gain a foothold for the Reform and Conservative movements at the Western Wall plaza, arrived this morning at the holy site, on the beginning of the Hebrew month of Elul. 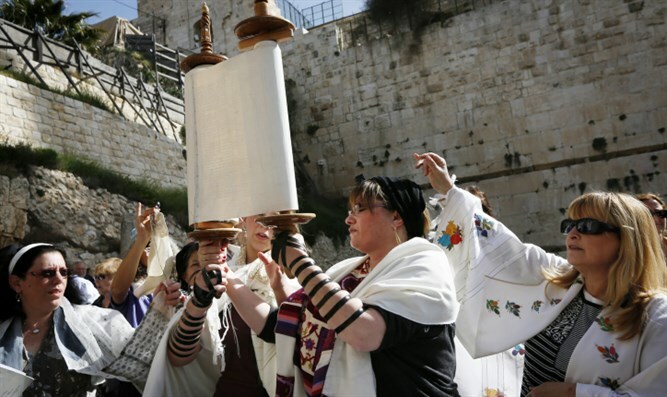 The women arrived equipped with shofars (ram’s horns blown on the upcoming Jewish High Holidays but also every morning in the Hebrew month of Elul which began on Sunday), but were at first prevented entry by order of the Rabbi of the Western Wall and Holy Sites, Rabbi Shmuel Rabinovich. According to Channel 10, after the heads of the group spoke with Doron Turgeman, the police chief in charge of the area, the group was allowed to enter with their shofars. During the group’s ceremony at the Western Wall, haredi women praying at the wall objected to the procession and tried to break up the proceedings, calling on the group not desecrate the holiness of the area.